Lake Country Low Profile Flat Foam Pads are 7/8" thin flat pads that have a new 45-degree cutback beveled backing that have multiple performance benefits. These benefits include a thin 7/8" pad design to help with horizontal foam pad movement with DA Polishers and a 45 degree bevel rather than the 90 degree bevel for a mild and clean cut that will increase the durability by giving a little more structural support. And finally, a front face bevel cut design for smooth and safe polishing on curved and angled body lines. These new pads are manufactured with high quality control standards and are made with a strong laminate bonding to insure a confident user experience and a durable pad life. 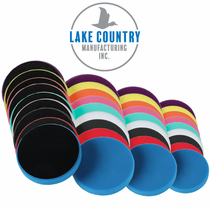 The hook and loop backing fits the corresponding and recommended Lake Country Backing Plates to perfection. Available in nine different grades and 3 different sizes. The recommended pad cleaner is the Lake Country Snappy Clean� Boost Pad Cleaner Packets.